BOSTON - Wednesday, October 25, 2017 - Mayor Martin J. Walsh today launched a first-in-the-nation Citywide credit building initiative, Boston Builds Credit (BBC), which will help 25,000 Boston residents attain a credit score of 660 or higher by the year 2025 through financial education and one-on-one financial coaching. The program will be launched in Roxbury, and will expand to Dorchester and Mattapan in the following years. Bank On Boston is part of a nationwide movement of Bank On programs led by the Cities for Financial Empowerment (CFE) Fund. 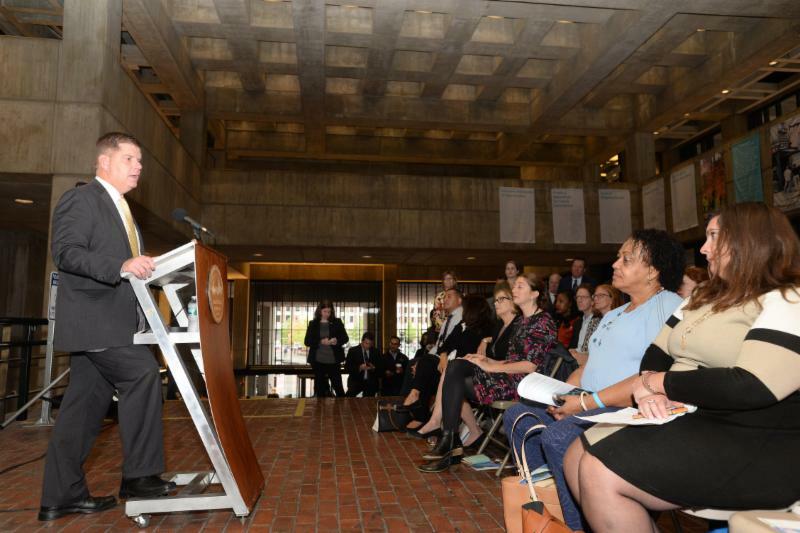 Bank On Boston will raise public awareness, expand access to financial education, and help connect residents to other OFE asset building initiatives such as Boston Saves, the Boston Tax Help Coalition, and Boston Builds Credit. The program in Boston is organized by the Mayor's Office of Financial Empowerment (OFE) and the Mayor's Office of New Urban Mechanics (MONUM), with the help of local financial institutions, community organizations, and city, state, and federal partner agencies. Find out more about the national Bank On movement at www.cfefund.org/bankon or about Bank On Boston at www.bankonboston.org. Boston Mayor Martin J. Walsh has made addressing income disparities a priority of his administration. As part of this undertaking, he formed the Office of Financial Empowerment in 2014. The Office of Financial Empowerment's mission is to connect City residents seeking to improve their financial situation with access to asset building programs, financial education and individualized coaching, and income support. By assisting residents to obtain the tools to achieve financial prosperity, economic well-being can become a reality for Bostonians of all ages. Additional information may be found at www.ofe.boston.gov and Twitter: @OFE_Boston. United Way of Massachusetts Bay and Merrimack Valley harnesses the power of communities working together - individuals, businesses, nonprofits and government agencies - to create positive, lasting change for people in need. United Way focuses on improving two foundations of better lives: Educational Success and Financial Opportunity. This include ensuring that individuals and families have safe housing, healthy food, quality child care, a job that allows them to support themselves and their family, and access to financial tools and coaching to help them build a better future. By funding the most effective nonprofits and programs, measuring their progress and mobilizing volunteers, United Way ensures donations deliver the greatest impact and real results in the community. Additional information may be found at www.unitedwaymassbay.org, Twitter: @UnitedWayMaBay.